The A.C. Gilbert Co. maintained factories in New Haven and Branford Connecticut along with their famed Gilbert Hall of Science, in New York City. Other cites such as Chicago and Washington, D.C., also had Halls of Science. The New York Hall of Science, had a massive train layout on the main floor along with displays of Erector and Science toys. On the second floor was another train layout not open to the public, it was reserved for salesmen, buyers and selected guests. Work shops and offices occupied the remaining floors. All the Halls of Science had been closed by 1966. 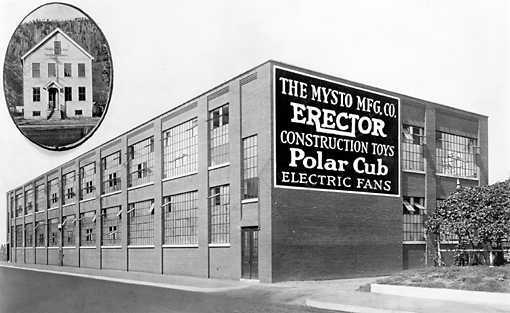 Gilbert in its hay day was one of the largest, best known and respected toy makers. It was also the largest manufacturer of fractional horsepower motors, holding the patent for enameled wire. In 2003, a TV movie, "The Man Who Saved Christmas", was loosely based on the life of A.C. Gilbert, his development of Erector sets and his work to continue making toys during World War I. When in Google Maps, Click "Street View"
Then Click on the Little Figure.